IAN VERRENDER. The banks, the Government and the half-trillion-dollar super grab. Just when they appeared on the cusp of victory, the major banks and AMP have had their ambitions to grab control of a lucrative section of the superannuation industry crushed. After just two fortnight-long public sessions, Commissioner Kenneth Hayne and his ruthlessly efficient senior counsel Rowena Orr have unearthed widespread corruption, lax regulatory oversight and even potential criminal behaviour at the most senior levels of our financial institutions. Senior government ministers, including Prime Minister Malcolm Turnbull, have been forced to backflip on their attitude to the industry, with many expressing regret for their staunch opposition to a royal commission. It may also nudge them to rethink their unwavering support for the banks in a long-running campaign to muscle their way into the MySuper default schemes. For the past two years, the banks have railed against the current system that restricts their access to around half a trillion dollars of savings in the MySuper system. Suddenly, they’ve gone very quiet on the issue which, given the crisis now engulfing AMP and casting a pall over the four majors, is hardly surprising. Oddly, despite a quarter of a century of outperformance by industry funds over their bank-run rivals, the Government until recently has thrown its weight behind the banks in the fight, arguing not-for-profit industry funds needed greater transparency and accusing them of siphoning off money for unions. While superannuation — and the role of industry funds in particular — has yet to be examined by the royal commission, only the bravest punter would bet they could come even close to our major banks on corruption, malfeasance and outright theft. Even if nothing more comes from this inquiry, it’s already had one hugely beneficial impact: the Federal Government is almost certain to adopt a far more balanced approach to much-needed superannuation reform. Our pollies love to boast about our world-class super system. Except, the only thing world-class about it is in the amount of fees our money managers manage to rake off the top. In the past decade, a little under a quarter of a trillion dollars has been siphoned off our retirement savings: $230 billion in the years since the financial crisis. That’s from a total pool of around $2.3 trillion. It’s an extraordinary number and nothing short of a national scandal. In 2016 alone, total fees amounted to $31 billion, according to research house Rainmaker. Of that, about 26 per cent, or $8 billion, was for administration, $7.8 billion went to investment managers and a whopping $8.4 billion for insurance sold through superannuation funds. As for the rest, financial advisors took around $5.9 billion while $600 million went towards asset consultants. Why so much? It may come as a shock to learn that almost no-one in the industry is paid purely on performance. For the most part, fees are generated not by earnings but by the amount of money under management. Given 9.5 per cent of almost every working Australian’s salary is shovelled into the industry, the amount of funds being managed grows enormously every week. It’s money for old rope. Perhaps these gargantuan fees could be excused if our money mangers regularly produced world-beating performances. Sadly, that’s not the case. Mostly, they perform in line with stock markets. When markets are rising, they produce good returns. When they tank, as they did a decade ago, super members see their funds shrink. But the fees roll on regardless. We’re a notoriously ambivalent lot, even when it comes to money. 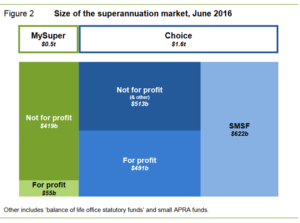 Vast numbers of Australians just don’t care about superannuation until it’s too late. That’s why a default superannuation system was developed several years ago in the wake of the Cooper Review: to put those who can’t be bothered into a no-frills, low-fee-charging fund. It followed years of fee gouging which left many working Australians with little or no retirement savings. The system is overseen by Fair Work Australia, which allocates a superannuation fund to each industry. If you don’t specify a fund, you’re automatically allocated a MySuper default fund. Industry Funds dominate this area, primarily because they’ve traditionally charged much lower fees than the for-profit funds run by the banks. 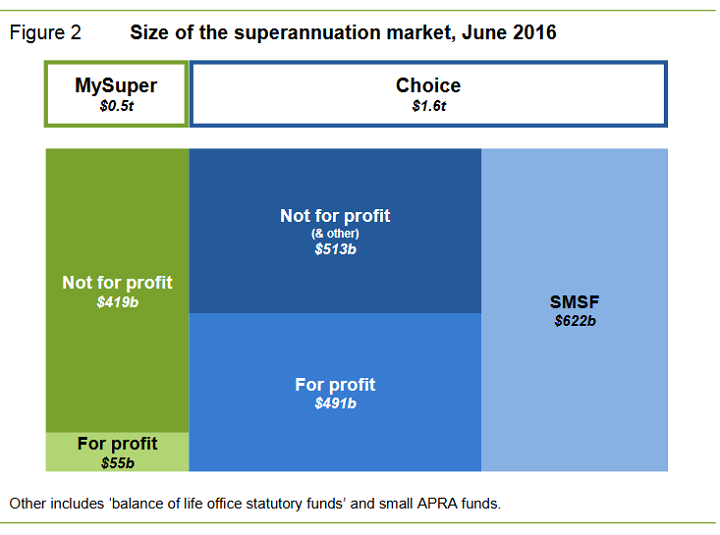 But as you can see from this Productivity Commission table, there’s an awful lot of Australians who really don’t care about super. And so, more than half a trillion dollars now is in default funds, the vast bulk of which is managed by Industry Funds. To get a foothold, many of the big banks have created no-frills MySuper funds and slashed fees. But they still have to turn a profit, so they’ve struggled to make much of a mark. Hence the political campaign. The common myth about Industry Funds is that they are trade union-dominated. It’s a view commonly reported in most parts of the media and perfectly articulated by Home Affairs Minister Peter Dutton shortly after the royal commission was called. “There’s another element to it — that is to have a look at some aspects within the industry super funds which have union members and whatnot on the board,” he told Sydney radio 2GB. While he was correct that union members are on industry fund boards, the “whatnot” to which Mr Dutton was referring are, in fact, business people who share equal billing. Industry funds are a partnership between workers and bosses. That’s why Inness Willox, who runs business lobby group AIG, is on the board of Australian Super as an employer group representative. The bank campaign for a slice of the default fund loot followed their strident opposition four years ago to a proposal that financial advisors should be forced to operate in their clients’ best interests. Despite the shake-up caused by those Future of Financial Advice reforms, the corporate regulator in January found most planners who worked for the big banks still failed to put their clients’ interests first. Combine that with the $220 million the banks and AMP have charged for services they had no intention of providing, and you get some idea of the potential for fee gouging that could take place within the default fund system. That aside, the default system is far from perfect and, like the rest of the industry, needs an overhaul, particularly when it comes to fees. Many workers are put into multiple funds, each time they switch industries or jobs. Then there’s the issue of performance. Industry funds overall have performed far better than bank-run funds. But not all industry funds have performed well. Sorting through this mess is the Productivity Commission, which is engaged in a major review of how best to improve our super system. It’s not due to be handed in until next year and won’t be released until 2020. But it provides a valuable escape clause for the Government. It was the Turnbull Government which called for the review in 2016, a call that provides it with the perfect cover for a quiet retreat from its recent support for the banks over super. This article was first published by ABC News on the 30th of April, 2018.